It's a revolution in people power: Sharing bikes for short trips to take cars off the road. 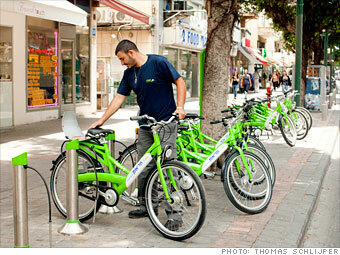 About 2,000 of Tel Aviv's distinctive green three-gear bicycles (right) are available for tourists and residents. Annual membership costs about 280 shekels, or $71. Bicycles are the world's most popular form of transit: About 133 million were produced last year, a nearly 600% increase from 1960 and more than twice the number of cars manufactured in 2011. Sharing programs, where members can pick up and drop off bikes at street-side rental stations, are on the rise in cities. In 2007 there were 60 such programs worldwide; today there are nearly 450. And soon, New York City. 70,000: The number of bicycles Wuhan, China, says are in its bike-share system, the largest in the world. In some Chinese cities, as much as half the population commutes by bike (in the Netherlands, it's 30%). The country also makes about two-thirds of the world's cycles. $1,600: The average cost per year to maintain a shared bike. In New York City's setup, which makes its debut this summer (at 10,000 bikes, the largest program in North America), borrowing a bike will cost $95 a year; in London it is $70 a year; in Paris it's about $36. $41 million: Amount paid by Citigroup to sponsor New York City's soon-to-launch 600-station service (called Citi Bike), which is being installed at no cost to taxpayers. In Europe many programs are run by advertising agencies such as Clear Channel Outdoor and JCDecaux. The search giant has an ambitious plan to achieve its goal: becoming the world's most energy-efficient company.